"After 14 years, 6/3/14, I had to put my girl down. Attached is her painting that hangs in my dining room. It is on the wall right next to my bedroom door. This is where Shadow slept. I loved the painting from the first day that I saw it and now it means more to me than ever. Thank you so much." 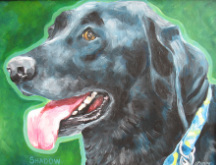 G.D.
"The portrait you painted of my grand-pup, Langston, has brought so much happiness to all. I was left honestly speechless when I first saw the picture. The likeness is amazing.We so appreciate your talent. Thank you for bringing years of enjoyment to the whole family." 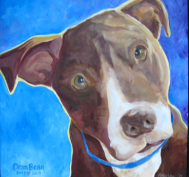 D.C.
"For 2 months I fostered Dean, a shelter dog with kidney failure. His passing was one of the most difficult experiences I've ever had to deal with in my life. On the day I went to pick up his ashes, Cathy presented me with a painted portrait of him. I broke down in tears and was so grateful for this gift because it was as though I was looking into Dean's eyes again. She captured them perfectly. It was as though he was there watching me to make sure I was OK. Cathy's paintings are truly remarkable and I believe it is because she has such deep compassion for animals. Therefore she is able to see our pets the way we see them and all the things that make them dear to our hearts."